The Romanian WASR10 rifle is a semiautomatic version of the Pistol Mitraliera model 19631965 configured with a fixed wooden stock and forend. 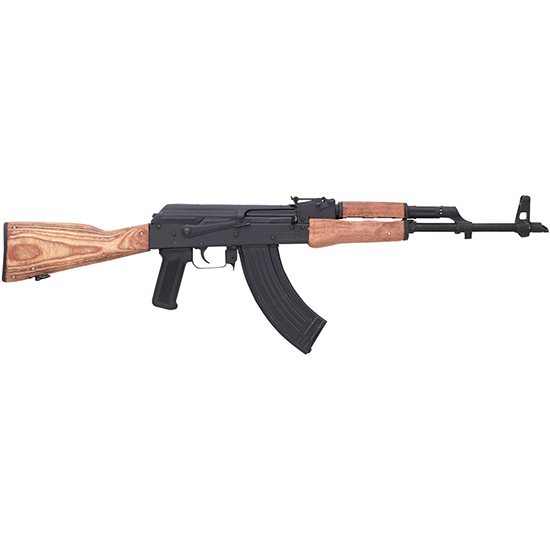 The WASR rifle is a perfect choice for hunters and recreational shooters. It features a 16.5 hard chromelined hammer forged barrel with a 110" twist and is chambered in 7.62x39mm. It has an overall length of 34.25" and weighs 7.5 lbs. It comes with one 30round magazine side mounted scope rail classic slant brake bayonet lug and a 1 year manufacturers warranty. Not available in NY NJ MA CA CT HI MD or where prohibited by law."